This weeks Shocking Saturday is a film which I wished would’ve had a lot more to it; it’s not that this movie was all round terrible, it just offered much more than it gave. I was hoping for a shocking exploitation film, with buckets of gore and perhaps a gripping story line – although since ‘A Serbian Film‘ I highly doubt many films will come close to giving me that same sickening feeling – unfortunately Snuff-Movie did not deliver. The film revolves around a horror director named Boris Arkadin, who is making his first film since his pregnant wife and crew were murdered at his mansion many years ago, a crime which he blames his own films for – now he is back and wants to make a horror movie like no other. Without knowing the official plot, the actors enter Arkadin’s mansion that is rigged with hundreds of cameras which are streaming live to the internet. At this point I was getting rather intrigued as it felt a lot like the story line from the films ‘Feardotcom’ and ‘Untraceable’, which I thought were excellent. As the cameras begin to roll it seems as if Arkadin really does want to create a horror film like no other; the actors start to become too intertwined with their roles and wonder if they have signed on for something much more sinister than what they were led to believe. 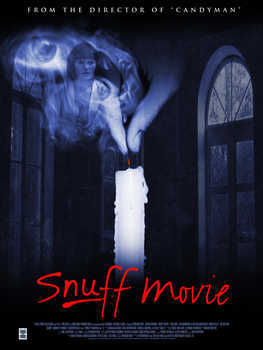 Snuff-Movie had so much potential to be a great horror film, especially with the title of the film you would expect something of a horrific nature, but although when there is gore it is top-notch, that can’t make up for the confusing plot and ending. Don’t get me wrong, I love a thought-provoking film, but this seems to be muddled up just for the sake of it, and the intentions of the main antagonist are never really explained. The reasons for his actions are crammed in at the film’s climax, right before an end scene jumbles everything up even more, which leaves us with even more unanswered questions. The talents of the main actors differ in my opinion, the portrayal of Boris Arkadin by Jeroen Krabbe, could quite possibly the finest part about this film, as he constantly has us change our feelings towards him. From sympathetic to empathetic to fear, he makes us see him in a different light with a snap of his fingers. However it is his performance which carries the film, as for the other actors this seems to be their first big film they have worked on due to their, at some points, terribly spoken lines which fail to make the viewer feel their emotions. Quite a disappointment from, Bernard Rose, director of the great horror flick Candyman, I really expected more from a horror great such as him. I can’t crap all over the film though; yes it didn’t really develop an official plot or the characters (apart from Arkadin), but for a late night watch it worked fine. It just needed to give a little more than what it did. At least it wasn’t as bad as Paranormal Activity 4.